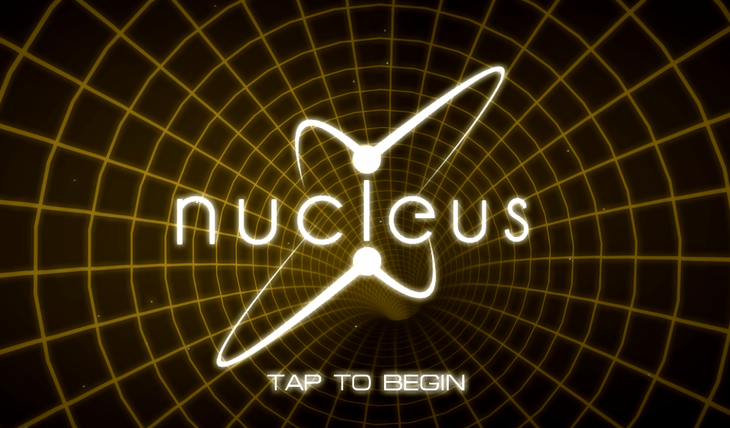 Nucleus is a game of basic geometry. There is a pulsating nucleus at the center of what seems like a cosmic wormhole. It is pulsating, and it definitely possesses a strong magnetic field. 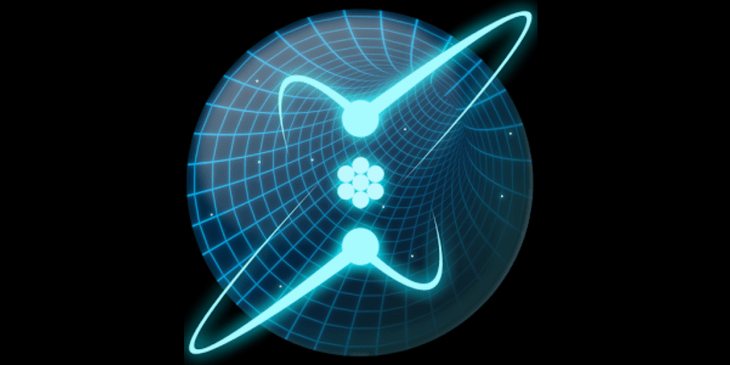 You need to swipe to create an orbiting sphere, and it is very clear the sphere will be orbiting the nucleus, unless you swipe too hard and send it shooting away from the nucleus’ radius. In the latter case, it is game over. You need to swipe carefully to send the sphere along a smooth orbit, so that it neither shoots beyond the limits, nor hits the nucleus, in which case it is also game over. The aim is to create as many orbiting spheres as possible, and time their appearance so that none of them hits neither the nucleus, nor any other sphere. You can swipe fast several times in a row to send 5-7 spheres along an identical orbit, but you will have to be very careful and precise in this case. 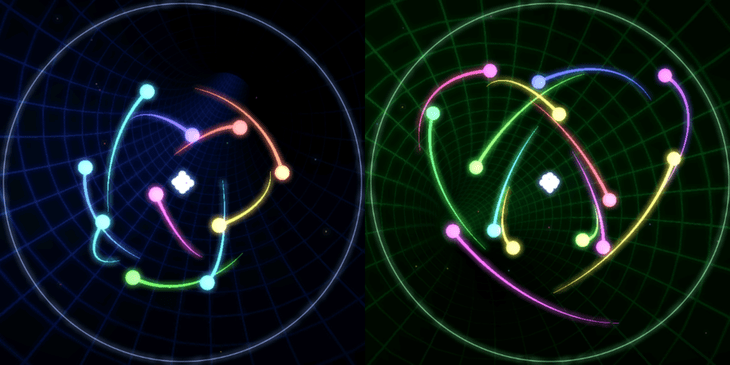 Likewise, you can send spheres in different directions, different trajectories and create a symphony of orbiting spheres. I like to think this is some kind of a Creator’s game, where the nucleus is the sun, and the spheres are the planets. This just proves what a gigantic job it was to create our Solar System, when I can’t have 9 spheres make piece on a single screen. Simplistic and intuitive, Nucleus’ control are one swipe movements you make to create shooting spheres. When you make many of them, they look like they’re dancing – a spectacle worth seeing. 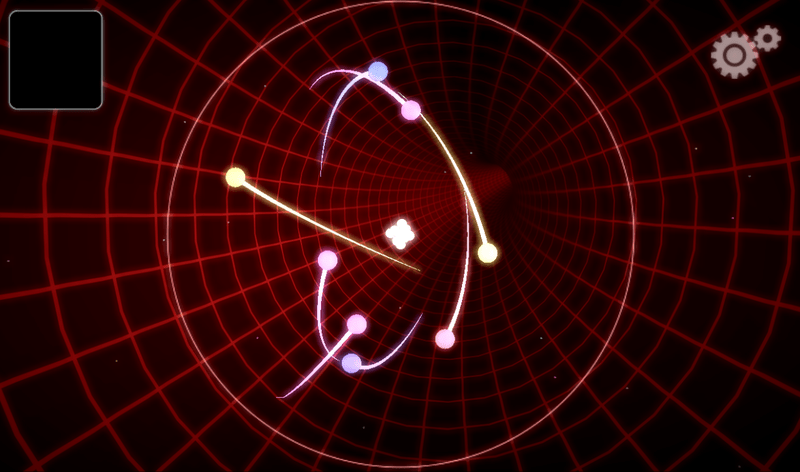 Overall, the controls are very responsive and when you fail, you know it’s only your judgment that let you down. The design in Nucleus is beautiful and has everything I like – Tron-like style of neon grid-drawn wormhole, shiny neon orbs dancing to the music, an ever-changing color scheme of the environment. 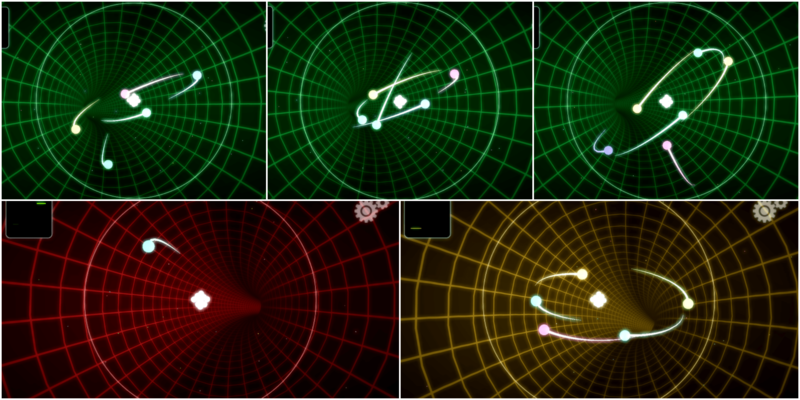 The game lets players switch from the hi-res neon colored quality to basic colors for the lower-end devices, or for those players who simply like that color scheme. To do so, click on the gear icon and see the settings bar appear to the right of the screen. The accelerate icon stands for visuals quality you can switch to high or low. In the same settings bar, you can join a global community of players and compete in ascending the leaderboard, or spread the news about the game in the social media. A special thank you to the developer for the choice of the soundtrack – it is peaceful, has a sci-fi air to it, and creates a special Stanley Kubrick-like atmosphere, which adds to the addiction and engrossing factor. I haven’t encountered any performance issues during my time with the game. The game is free, ad-supported, so occasionally you will see an ad, but truth be told, I was so engrossed I haven’t registered a single case when an ad distracted me from the gameplay. What I like best is the excellent replay value in this free game you can play offline. 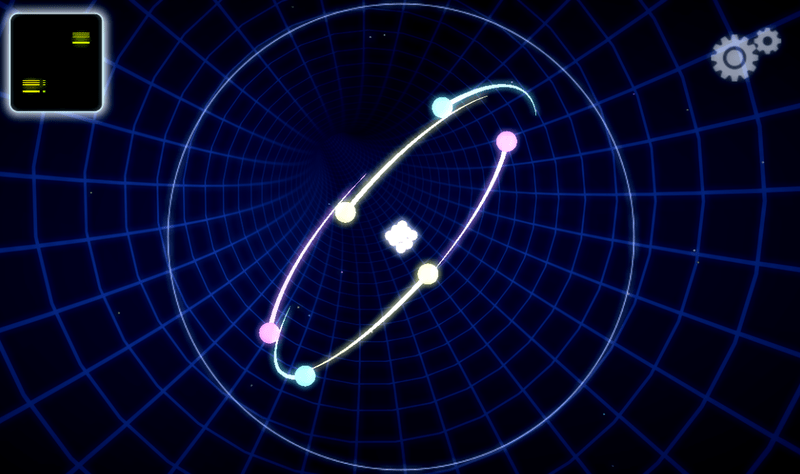 The more orbs you send orbiting around the nucleus, the higher score you get. I haven’t figured out how the scores work, though, but the more circles around the nucleus an orb makes, the higher your score. The score is a combination of a letter and a number, which turned out to be a name of elements of Periodic Table. What do you know, all this time I was playing thinking I was making planets. Correct me if I am wrong, but the point is – the score is secondary in this game. Once you shoot the first group of spheres, pardon, electrons, into a life of a perfectly shaped dance, you will be thinking of how to add at least one more electron into the peaceful coexistence. 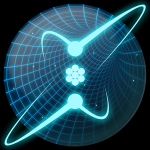 Nucleus is a beautiful, elegant and smart game that involves spatial thinking and a little bit of strategy to pace and time the electrons orbiting around the nucleus. It doesn’t stress the Periodic Elements premise, though, and if you like, you can think of any other imaginary story, like being a cosmic creator shaping a brand new solar system enclosed in a small shining sphere hanging on Orion’s belt, only Orion is a MIB cat. The game, if you intend to beat it, is hard, but if you only intend to enjoy it, offers a great replay value and hours of thoughtful fun. All things considered, it is a wonderful indie gem. Get it. P.S. The iOS port is in the works now. 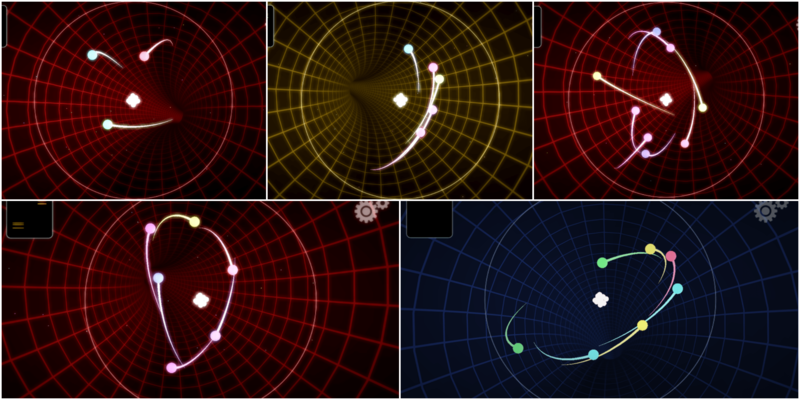 Nucleus is a beautiful, elegant and smart game that involves spatial thinking and a little bit of strategy to pace and time the electrons orbiting around the nucleus. The game offers a great replay value and hours of thoughtful fun. All things considered, it is a wonderful indie gem. Get it.